Well if you have a wonderful neighbor like I do and live in California, you just may hear the door bell and find 5 huge stems of Cymbidium Orchids on your step with your neighbor waving as she is on her way to her car. It is the season for Cymbidiums in California. When I saw the size of the stems, I thought I'm going to need my extra large cylinder vase and large river rocks to counter balance the weight of all of these stems. 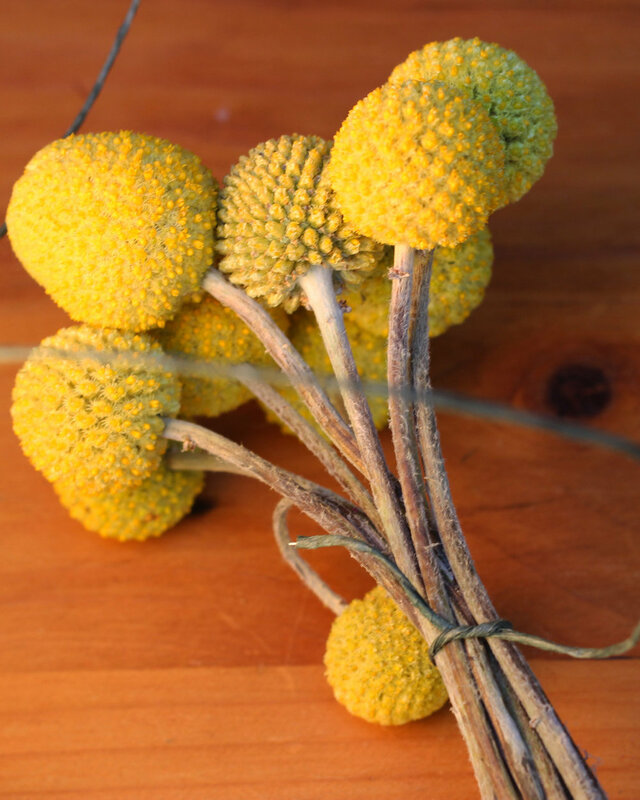 I cut several stems from my Asparagus Fern and my Boston Fern and combined those with the Cymbidiums and other exotics: yellow Billy Balls, Green Ball Dianthus, brown Fiddlehead Fern Curls, yellow Pincushion Protea, pink Protea, and green Anthurium. 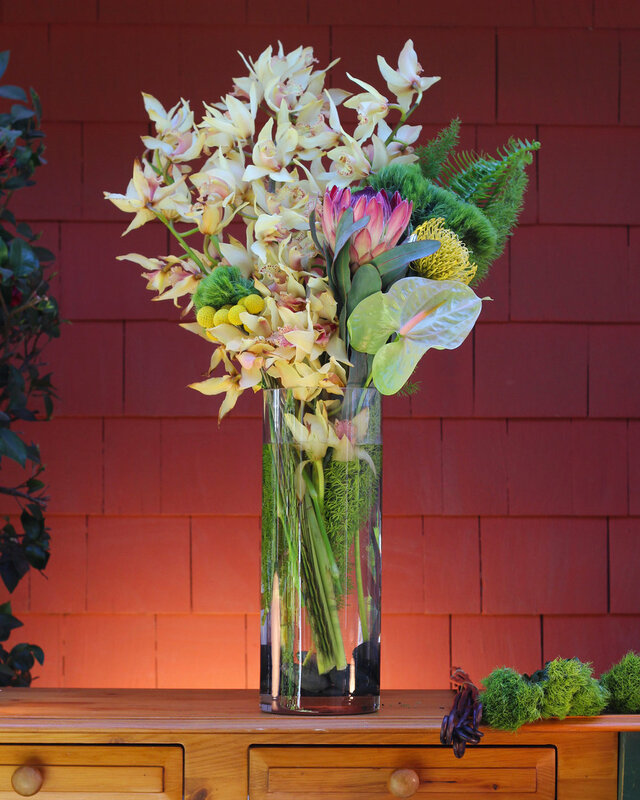 This is a very large arrangement and stands about 36 inches tall. 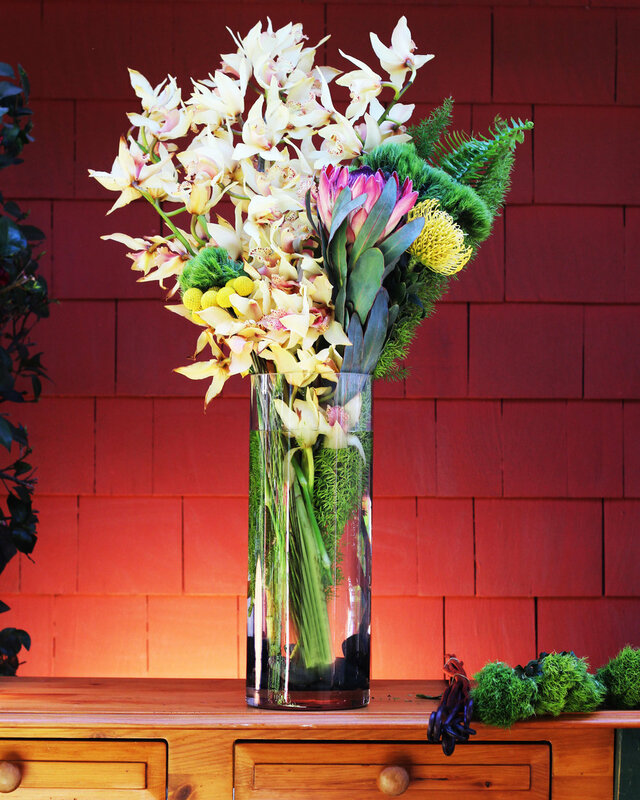 It is suited for a large room, an arrangement for a head table at an event, or a large entry. In a future post we will make a smaller version of this arrangement. Now hold onto your hat and let's tackle this extra-large arrangement. Take 1/3 of Bear grass. Pull out short pieces. Set aside. Carefully lay river rocks in bottom of vase. Fill with water to 3 inches below rim. Pull leaves off Protea that will be below water line. Put orchids left to center with ferns, Protea & Pincushion on right. Use stripper to take leaves below surface of water off Green Ball. Put 3 Green Ball Dianthus behind Proteas. Use bindwire. Double knot near top. 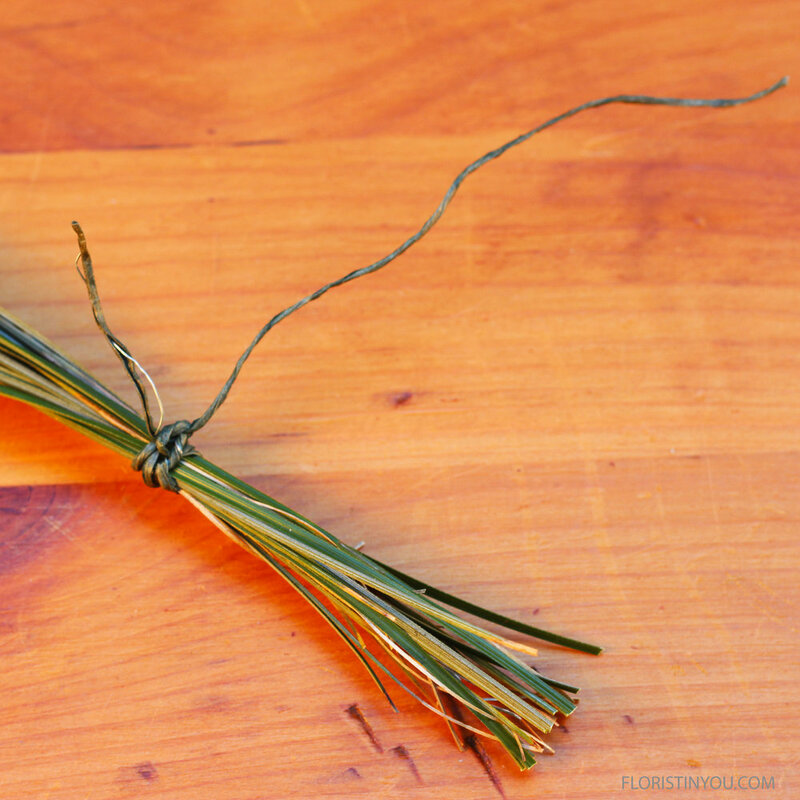 Wrap 3 times and double knot again. Bind Billy Balls at bottom too. Insert Billy Balls on left with 2-3 Green Balls behind them that are an inch and a half taller. Insert anthurium on right just above the rim. Bind the bottom of grass. Double knot, wrap 3 times, double knot again. Repeat process for tips, but leave about 3 inches of bindwire to secure to ends. 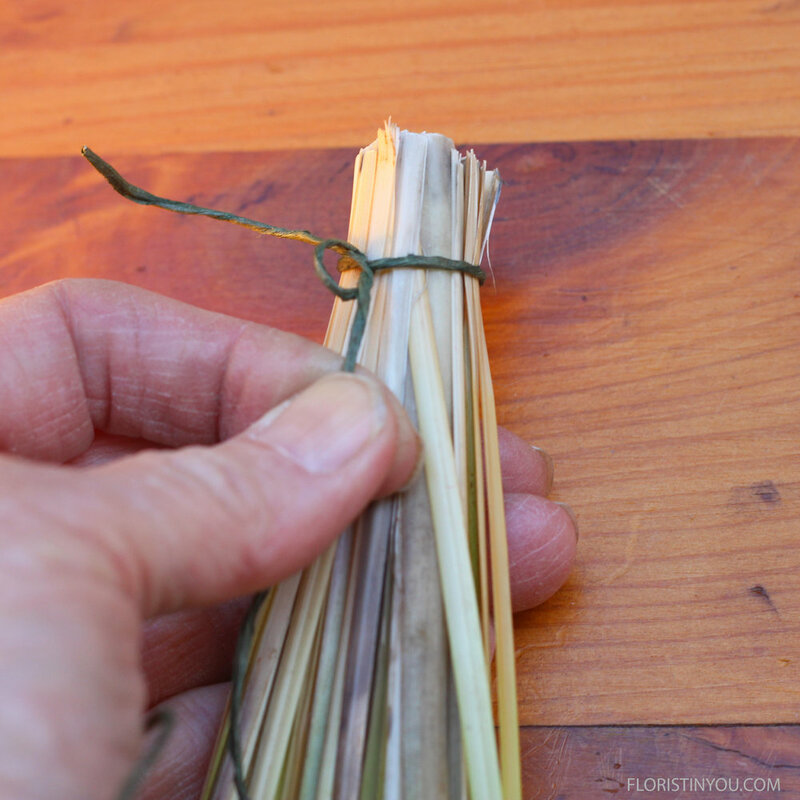 Attach long wire at the tips by wrapping it around Bear Grass 2 inches above the ends, making a loop. Double knot. This yard stick gives an idea of the scale of this arrangement. You can see where the Fiddlehead Fern Curls get their name. 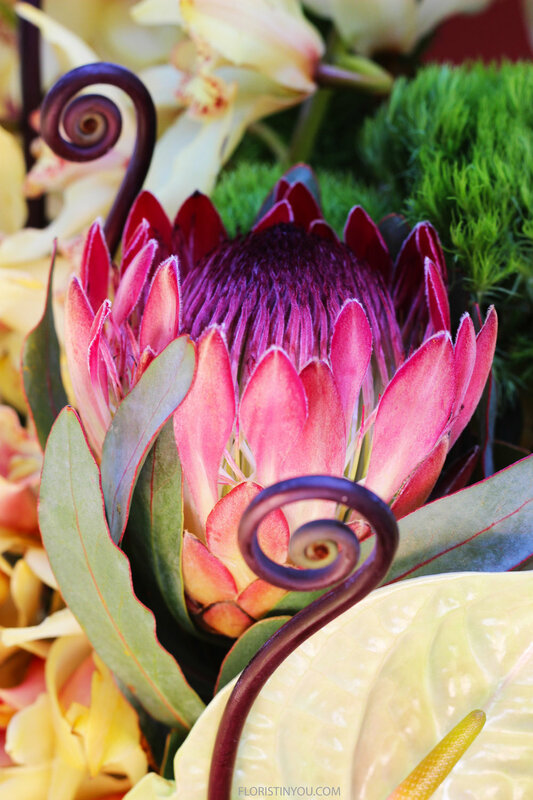 The pink Protea looks like an artichoke on fire.